1) "Acidized WAV" folder - Inside are 4 subfolders containing wav loops, all categorized by popular hip hop tempos: 87BPM, 92BPM, 97BPM, and 102BPM. Each tempo-based subfolder contains 72 different, rhythmic loops for a total of 288 loops. All loops are geniune, uniquely recorded performances. None of ModernBeats' tempo-based loops were not created through resampling or time stretching/compressing, but were all recorded separately at different hip hop tempos to capture the full realism of the live percussion rhythms. 2) "Dr. Rex" folder - There are 72 loops (created from a 92BPM source tempo) in REX2 format, loadable through Propellerhead's Reason software with the Dr.Rex module (also available for sale at ModernBeats.com). REX2 users can efficiently scan through the loops while playing back their project in real-time. No matter what tempo you're working with, ModernBeats' REX2 loops will sync to your beat! 3) "SF2 + MIDI" folder - The "SF2 + MIDI" format was created as a unique application for software users who don't use Reason but still desire full control over a loop's tempo and splice arrangement. To use this format, load the desired SF2 into any SoundFont compatible sampler and/or soundfont player, then "Import" the MIDI file of the same name into your host's MIDI track layout. The chromatic samples in the SF2 preset will be triggered by the MIDI track in sequence, controlled by tempo. Created from a 92BPM source tempo, you can adjust your project's tempo accordingly and the loop splices will trigger in sync! In addition, loop splices can be rearranged to create a virtually endless variety of unique ethnic loop rhythms dictated by the user's imagination. The "Ethnic Percussion Loops" library offers users added value, unleashing the normal confinements of loop-based libraries by providing extra flexibility when using the included REX2 or SF2+MIDI formats! Rearrange the MIDI events to create your own variations and/or simply re-sequence the provided splices into brand new patterns. The possibilities are virtually endless! 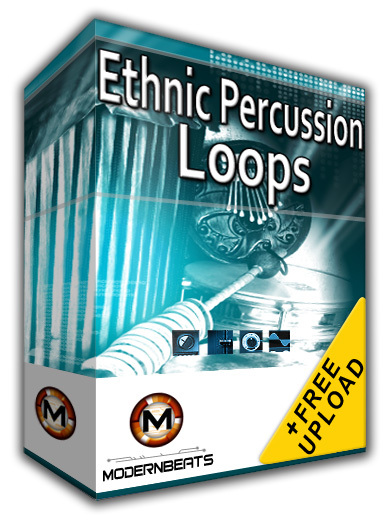 Creating realistic ethnic hip hop beats has never been easier with "Ethnic Percussion Loops" and its live recorded ethnic percussion rhythms! All loops have been recorded at varying popular hip hop tempos, specifically aimed at providing the user with a unique edge in hip hop production. Each loop can be loaded into all major software samplers and host music software programs from the 3 major formats provided.